I’ve been waiting to share this skirt with you all for months now and the day has finally arrived!!! I’m so obsessed with this print, it works for any season but is perfect for summer! I hope you love it as much as I do! Very pretty!! That really is the perfect summer piece. Great designing! Hi Ali!! Thank you so much! Im so happy you love it! Thanks so much for commenting!! 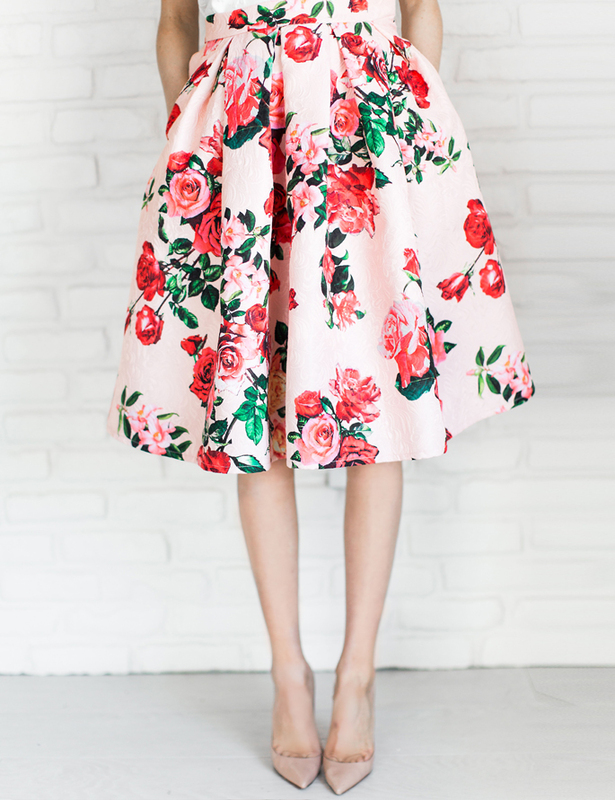 Oh my goodness this skirt could not be any more gorgeous! It’s perfect!!! Totally obsessed! gorgeous skirt! and I am loving this brick wall backdrop for your clothing line! so cute for photos! What a gorgeous print! Love it! Oh wow! Such a majestic skirt! Love at first sight! I LOVE this skirt! It has the prettiest floral print and love the color. Can’t wait to check out the rest of the collection. This skirt is so great!!! I am in love with the print and colors – it’s a statement piece for sure!! I ADORE that skirt! So beautiful! what an elegant and chic look! Really beautiful Rach. Great job on all the pieces, they are lovely! This is gorgeous! Its PERFECT! Really gorgeous skirt! Definitely perfect for summer! Wow… Awesome design, lady! I think this skirt print may be my favorite one yet! LOVE!! Love this skirt – the print is beautiful!! Oh wow, this is so beautiful! This might be my favorite piece of your collection so far! It’s amazing!! I love the rose print and the colors are stunning!! Such a cute midi skirt print, so spring and summery. It looks adorable on you! That skirt is to die for!!! Love the print. Oh my gosh Phyllis, thank you so much! Im so happy you like it!! Very pretty pattern! The silhouette and the shape look just like you! Love this skirt! So beautiful! I’m obsessed with this!! It is stunning and I love how the pink and red look together. I love the print of this skirt AND that it has pockets!! Hi Karen!! I know I love pockets in skirts so I wanted to make sure this skirt had them!! That pattern is GORGEOUS!! Love the colors in it. Hi Helena!! Thank you so much! I was so excited to launch it for you guys!! so pretty love it rach! Have a lovely day! I absolutely love floral prints this time of year! Cute skirt! I agree, that skirt is right for anytime of the year! Floral fabulous. Your collection is so stunning! I just loveee this print! You are killing it with you clothing line! So gorgeous!!! That skirt is amazing! You are so talented Rachel! Love this print! So cute! When you think about it, that’s got to be the right anrwes. Such a lovely skirt! I particularly love that its textured. This skirt is beautiful, I love the pattern! Looks so beautiful on you! Gorgeous print! So glad the line is doing well! Congrats! This skirt is so gorgeous! I love the rose print! Gorgeous print! I totally need that skirt! I love this skirt! Such a pretty pattern. Lace is so pretty and elegant! Love your baby bump! 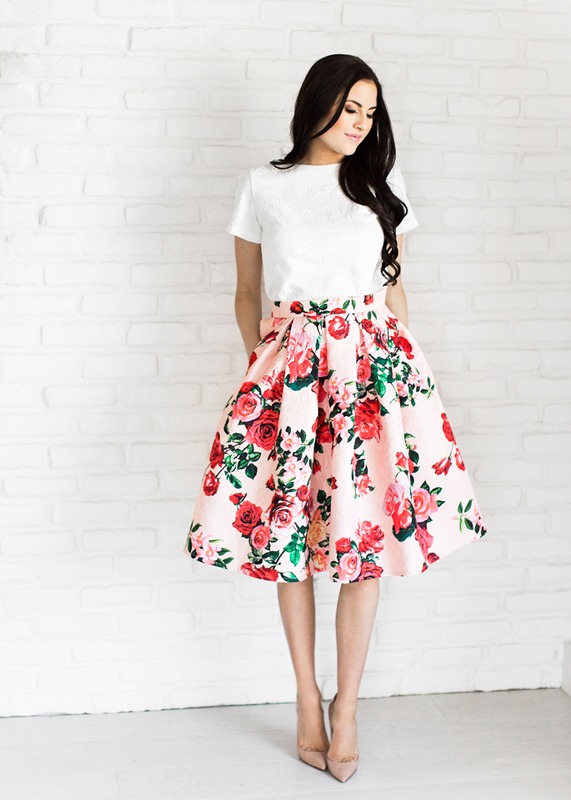 That skirt is absolutely gorgeous, such a pretty print! Any chance you might ship internationally soon? Namely Australia? Such a gorgeous dress OMG!!! You wear it very well! I never thought I would find such an everyday topic so enlrtalhing! This is STUNNING! Sure to be a sellout for you!! I don’t believe we have any of these left :( I’m sorry! But there are others on the site you might like!